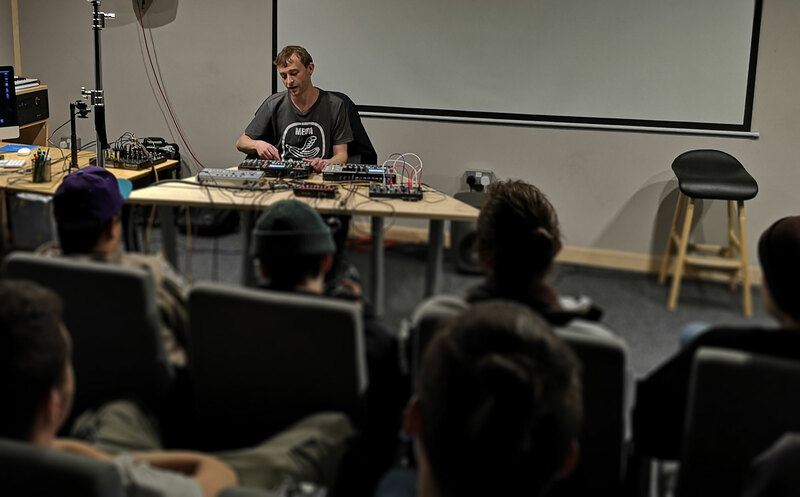 After recently visiting dBs Music Bristol campus to give our degree students a masterclass in his hardware-based live rig, we chatted to Ben to find out more about his career, influences and what sparked his interest in hardware. So, why hardware and not a DJ setup or Laptop with controllers? 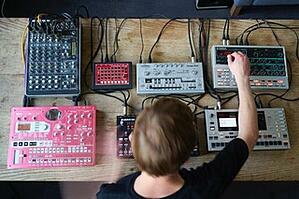 "I started making music when there was no other option than to have hardware to make sounds. My first proper setup was with an Amiga running a tracker called Octamed, which had quite limited audio options, so I bought an Akai S950 and a Nord1 Rack to make most of my sounds. The fact there was limited sample time meant you had to be inventive and create around the limitations, which yielded its own rewards." Does the hardware dictate the sound you make or do you have a sound you want to make and try and find the hardware to achieve it? 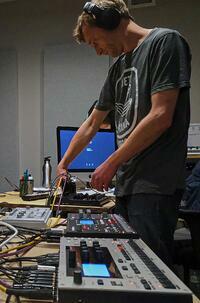 "I think hardware choice does dictate the sound a fair bit, which is also something I enjoy. It's another boundary which keeps me focused on making stuff sound original, which is really important to me. Whichever piece of kit I have I’m usually quite deliberately trying to push it to the point of making it fall over, without actually doing so hopefully! "Elektron stuff has a really unique workflow and is totally geared towards live performance in a way that other stuff isn’t as focused on that. It can be quite a steep leaning curve to start with, but totally worth persevering. 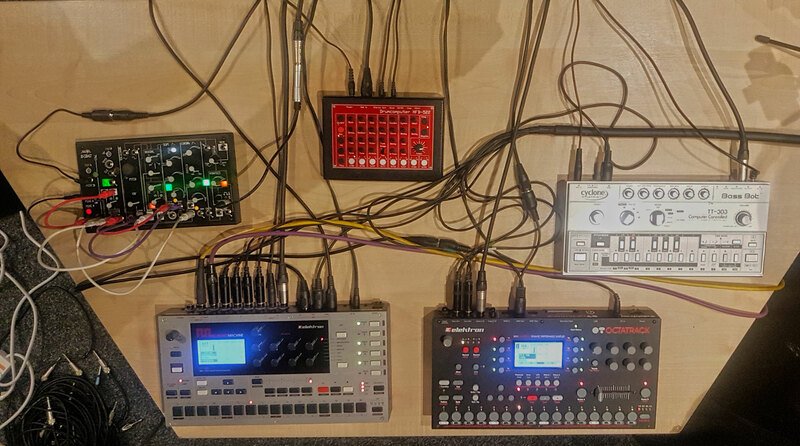 Before that my live set for years had a Korg ESX1 [large red unit in image left] its heart, which is still possibly my most used piece of kit ever. I had to buy a new one as I wore out the membrane buttons on the old one. Only 26MB of RAM in that but I could play off it for hours if needed." Do you'll think you'll ever integrate a laptop? "I use my laptop for production every day but just not for live performance. I’m a creature of habit I think. It also helps me find a different headspace for the live thing having it all in dedicated boxes." What's your setup in the studio? "Now I have it all set up, so I can record in 16-channels from my desk if needs be. The rig is used in my studio productions a lot, but there is a also lot of cross pollination. I’ve recently got really into doing multiple passes of resampling between Ableton and the Octatrack, not really knowing how it will turn out when I start something and stumbling across a series of happy accidents. The accidents get happier and more frequent the more I do that, seemingly." "I’ve been working on a brand new liveset under the alias OverworX. debuting that at Brockout in Bristol on 21st December, I’m also DJing in Glasgow the night after. It’s my most ambitious live thing to date, because its more truly 'live' than ever but also the most 'dancefloor' and to do both of those together is a challenge. Part of what you see in the video was the starting point of that which has changed quite a lot now. I’ve got the second OverworX 12-inch release lined for next year plus a new Ben Pest 12-inch, lots more in the pipeline too as I write compulsively. I’ve also just started a brand new collaborative techno project I’m really excited about."